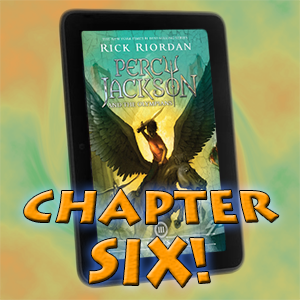 This felt like a pretty quick chapter, and wasn’t one of my favorites due to my being mildly annoyed with Percy. I’ll get to that in a moment, but first, Grover’s really quite, ah, bedazzled with the Hunters, isn’t he? 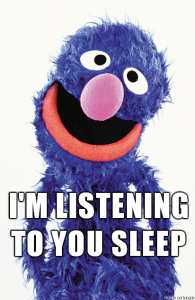 Uh, no, Grover, I’m going to have to go with Percy on that one. Creepy. But I’d mentioned being irked with Percy, hadn’t I? It primarily comes down to his moping most of the day about his dream instead of talking to anyone about it who might have some insight. It’s true to Percy’s character, but it’s a bothersome trait for me to read. I hate when characters decide not to do something just because there’s a possibility that it won’t lead to results, even though the act of trying costs them nothing. After that, I sat in the empty chariot stands and sulked. Down at the archery fields, Chiron was conducting target practice. I knew he’d be the best person to talk to. Maybe he could give me some advice, but something held me back. I had a feeling Chiron would try to protect me, like he always did. He might not tell me everything he knew. So Chiron MIGHT not tell him everything he knew, so instead he goes to talk with the Oracle. The Oracle? Because Oracular visions are always so straightforward?? Note: I’m on day 4 of quitting caffeine cold-turkey, so I might be a teensy more cranky than usual, too. Suppose Hermes will kill Luke? Then again, there’s nothing that says that the one shall perish by THEIR parent’s hand, is there? One final thought: Grover found Hunter brochures in Annabeth’s backpack. So she was possibly thinking about joining the Hunters? Is this what she should “probably tell” Percy? Or did she just have the brochures because they’re trying to recruit her and what she has to tell Percy is something else? The former is the more straightforward option, but I’m not willing to bet on it just yet. Riordan might be trying a fake-out here (and I really like that I can’t predict which way it will go). So is the Oracle going to live out there by the river for a while now, or is she just resting before she goes back? 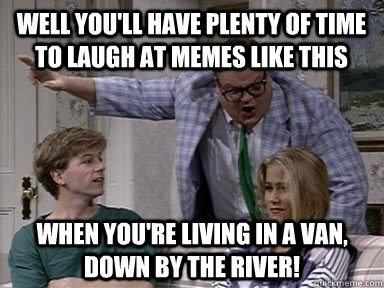 If Chiron can get her a van to have some shelter there, then the Oracle will have plenty of time to deliver mysterious prophetic visions when…she’s livin’ in a VAN down by the RIVER! That’s a reference for those who remember the early-nineties. I’m old.